Lava caves only form when fluid basalt flows out of a volcano forming a river of molten rock. The sides of the flow slowly crust over forming a roof over the flow. When the eruption stops the lava pours out the end of a lava tube forming a cave. If the roof of a lava tube is weak, parts of it may fall into the lava flow and be carried away forming a skylight. Scientists often take samples of the lava during an eruption by dipping containers into the flowing lava through a skylight. After the eruption ceases the roof will continue to cool and contract. If the roof over the molten rock is thin it sometimes creates a new skylight. Skylights are often used as entrances to underground caves by people who explore caves. There are many places in the world where you can find these caves. The most important place to study them is the Hawaiian Islands because of the frequent eruptions of Kilauea and Mauna Loa. There are miles and miles of lava tubes that have formed caves on the Big Island of Hawaii. 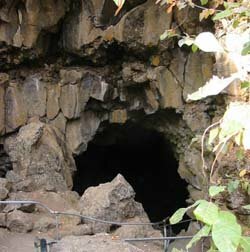 Thurston Cave on the summit of Kilauea is the most famous caves. Several companies now offer tours of lava tubes on the Hawaiian Islands. Ape cave on the flanks of Mount Saint Helens in Washington is over two miles long. It is the longest cave in continental United States and is open to visitors year around. Lava Caves Find out how pahoehoe lava flows form these caves.